For large deployments, you might need additional on-premises process servers to scale capacity. For failback, you need a temporary process server set up in Azure. You can delete this VM when failback is done. This article summarizes typical management tasks for these additional process servers. Sign in to the process server as an Administrator. Download the latest version of the Unified Setup. Double-click the installer to launch the update process. The installer will detect the various components that are installed and upgrade them to the latest version. 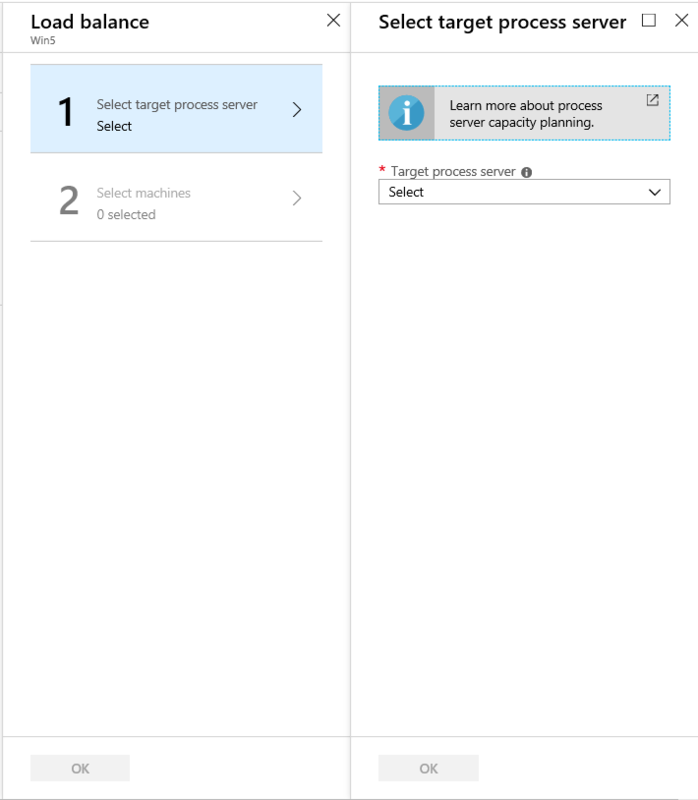 Typically, when you use the Azure Gallery Image to create a process server in Azure for the purposes of failback, it's running the latest version available. The Site Recovery teams release fixes and enhancements on a regular basis, and we recommend you keep process servers up-to-date. Navigate to Recovery Services Vault > Manage > Site Recovery Infrastructure > For VMware & Physical machines > Configuration Servers. Click on the configuration server to which the process servers are registered with. List of process servers registered to the configuration servers are available on the page. Click on the process server on which you wish to modify the workload. You can either use Load Balance or Switch options, as explained below, as per the requirement. Through this option, you can select one or more virtual machines and can transfer them to another process server. Click on Select machines, choose the virtual machines you wish to move from current process server to the target process server. Details of average data change are displayed against each virtual machine. Click OK. Monitor the progress of the job under Recovery Services Vault > Monitoring > Site Recovery jobs. It takes 15 minutes for the changes to reflect post successful completion of this operation OR refresh the configuration server for immediate effect. Through this option, entire workload protected under a process server is moved to a different process server. Click on Switch, select the Target process server, click OK.
Monitor the progress of the job under Recovery Services Vault > Monitoring > Site Recovery jobs. 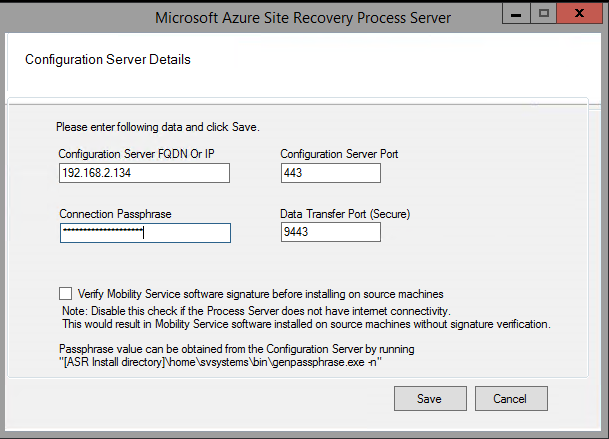 Azure Site Recovery automatically identifies if Process Server is approaching its usage limits. Guidance is provided when you to set up a scale-out process server. Healthy (Green) Process server is connected and is healthy CPU and memory utilization is below 80%; Free space availability is above 30% This process server can be used to protect additional servers. Ensure that the new workload is within the defined process server limits. Warning (Orange) Process server is connected but certain resources are about to reach maximum limits CPU and memory utilization is between 80% - 95%; Free space availability is between 25% - 30% Usage of process server is close to threshold values. Adding new servers to same process server will lead to crossing the threshold values and can impact existing protected items. It is advised to setup a scale-out process server for new replications. Warning (Orange) Process server is connected but data wasn't uploaded to Azure in last 30 min Resource utilization is within threshold limits Troubleshoot data upload failures before adding new workloads OR setup a scale-out process server for new replications. Critical (Red) Process server might be disconnected Resource utilization is within threshold limits Troubleshoot Process server connectivity issues OR setup a scale-out process server for new replications. Critical (Red) Resource utilization has crossed threshold limits CPU and memory utilization is above 95%; Free space availability is less than 25%. Adding new workloads to same process server is disabled as resource threshold limits are already met. So, setup a scale-out process server for new replications. Connect to the Process Server virtual machine using Remote Desktop Connection. You can launch the cspsconfigtool.exe by clicking on the shortcut available on the desktop. (The tool will be automatically launched if this the first time you are logging into the process server). Connection Passphrase to connect to the configuration server. Data Transfer port to be configured for this Process Server. Leave the default value as is unless you have changed it to a different port number in your environment. Click the save button to save the configuration and register the Process Server. On the process server, open an administrator command prompt. 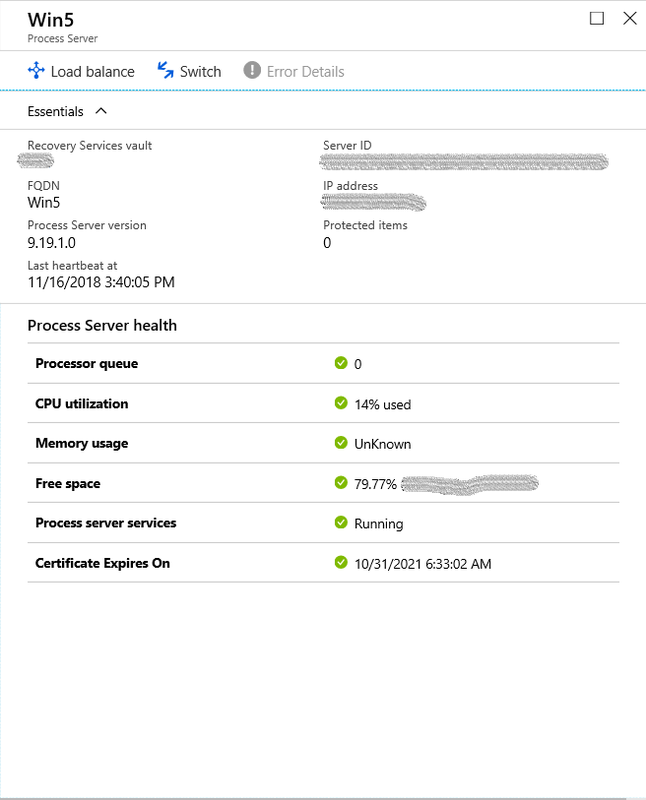 If the process server uses a proxy to connect to Site Recovery in Azure, use this procedure if you need to modify existing proxy settings. Log onto the process server machine. The steps to unregister a process server differs depending on its connection status with the Configuration Server. Remote into the process server as an Administrator. Launch the Control Panel and open Programs > Uninstall a program. Uninstall a program named Microsoft Azure Site Recovery Mobility Service/Master Target Server. Uninstall a program named Microsoft Azure Site Recovery Configuration/Process Server. When the programs in steps 3 and 4 are uninstalled, you can uninstall Microsoft Azure Site Recovery Configuration/Process Server Dependencies. Use the below steps if there is no way to revive the virtual machine on which the Process Server was installed. Sign in to your configuration server as an Administrator. Open an Administrative command prompt and browse to the directory %ProgramData%\ASR\home\svsystems\bin. The above command will provide the list of process server(s) (can be more than one, in case of duplicate entries) with serial number(S.No), IP address (IP), name of the VM on which process server is deployed (Name), Heart beat of the VM (Heartbeat) as shown below. Now, enter the serial number of the process server you wish to un-register.